I really enjoyed reading this short book and many of Gerver’s ideas made real sense to me. The book is written in short sections which each give clear points on how you can enact change, in your school, or organisation, with Gerver’s own examples about embracing change and working with it as part of your every day life. 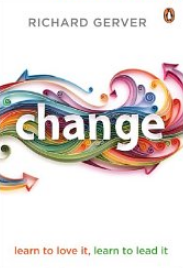 Gerver challenges the reader to develop our own “Change App’, asking questions which reinforce his main points he is making about change and how we plan for it, react to is and lead others into it. Different sections of the book talk about how we can shape school culture, work with our colleagues, make a difference to the lives of students, shift attitudes in our own life, as well as others. I found myself thinking a lot about about the vision and values discussed in this book and how they related to my own school. Most resonant with me after reading was the idea that one person cannot be the sole catalyst for change, you have to trust your team ( Lencioni would concur!) and remember that the best ideas will most likely come not from you, but from the teams around you. Yes: Gerver uses examples based on his many real experiences as a head teacher, backed up with research evidence from a wide variety of sources. There is a comprehensive bibliography at the back of the book.